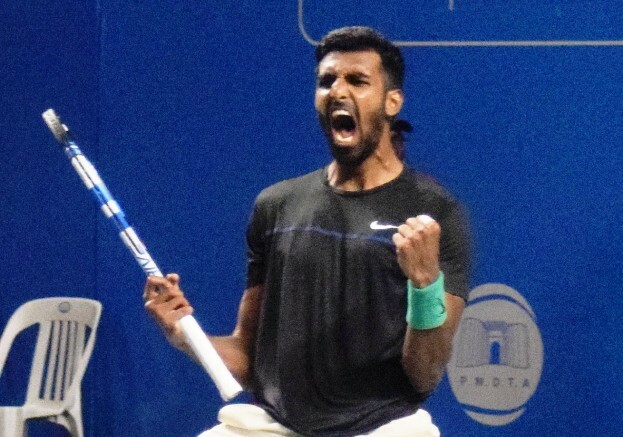 India's Prajnesh Gunneswaran exults after upsetting top seed from Maldova on Friday. Pune: Prajnesh Gunneswaran kept his reputation as India’s new tennis star as he reached the second final in a row upsetting top seed Radu Albot at the KPIT MSLTA ATP Challenger organized by MSLTA and PMDTA and played at the Mhalunge-Balewadi Tennis Complex here Friday. “ I made my game today and put pressure at the right time , played consistently in the match “ Said Prajnesh I will go for the second title in a row for sure . Prajnesh opponent will be third seeded Elias Ymer Sweden who stopped the winning run of Bradyen Schnur of Canada 6-3, 3-6, 6-3 in 1 hour and 53 minutes. The results, semifinals:  Prajnesh Gunneswaran (IND) bt  Radu Albot (MLD) 1-6, 6-4, 6-4;  Elias Ymer (SWE) bt Bradyen Schnur (CAN) 6-3, 3-6, 6-3. Doubles:  HSIEH, Cheng-Peng(TPE)/YANG, Tsung-Hua (TPE) bt Max Purcell (AUS)/Luke Saville (AUS)(4)6-7, 6-3, 10-6; N. Vijay Sundar Prashanth (IND)/Ramkumar Ramanathan (IND) bt  Andrej MARTIN (SVK)/Hans PODLIPNIK-CASTILLO (CHI) 7-6(7), 6-0.